Welcome to the American Thoracic Society’s 2015 International Conference, where you are among thousands of your colleagues from around the world who have come to learn and share the latest in adult and pediatric pulmonary, critical care, and sleep medicine. 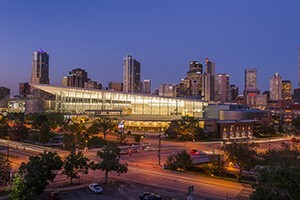 During ATS 2015, you will find a wealth of inspiration from the more than 500 sessions, 800 speakers, and nearly 5,500 original research abstracts and case reports; more than 200 exhibiting organizations; and countless networking opportunities. And it’s all happening in one beautiful city, Denver, the home of world-renowned medical institutions focused on understanding pathogenesis and developing better therapies for respiratory diseases. Today’s highlights include the beginning of the Society’s celebration of its 110th anniversary with the Discoveries Series, the first presentations of the Basic Science Core theme “Host Pathogen Interactions and Host Defense,” the President’s Symposium on cystic fibrosis, the opening of the Exhibit Hall, the ATS Respiratory Health Awards Ceremony and Dr. James Burns Amberson Lecture, new sessions for medical educators, year-in-review sessions, and much more. ATS 2015 has placed an emphasis on efficiently fulfilling the needs of clinicians, and this morning will see the start of the Adult and Pediatric Core Curricula. Attendees have the opportunity to earn up to 35 American Board of Internal Medicine MOC Medical Knowledge Points by participating in Core Curriculum sessions for all three pillars—pulmonary, critical care, and sleep. Attendees also have the opportunity to earn 10 American Board of Pediatrics MOC Part 2 Self-Assessment credits by completing Pediatric Core Curricula requirements. Preview coverage of these highlights and more can be found throughout this issue of the ATS Daily Bulletin and in the ATS 2015 Final Program. The designation of AMA PRA Category 1 Credit(s)™ per session is available in the Final Program. Physicians should only claim the credit commensurate with the extent of their participation in the activity. This live activity has been planned and implemented in accordance with the essential areas and policies of the ACCME and are free from the control of commercial interests. The ATS is unable to offer AMA PRA Category 1 Credit(s)™ for sessions that include presentations made by industry-employed speakers if the topic of their presentation relates to a product or business line of their employer. Most of the major symposia, postgraduate courses, workshops and seminars are eligible for AMA PRA Category 1 Credit(s)™. The American Thoracic Society has also partnered with National Jewish Health® to provide Nursing Contact Hours for selected sessions. National Jewish Health® is approved by the California Board of Registered Nursing, Provider Number CEP 12724. The International Conference Committee welcomes you to Denver! Together we’ll inspire each other—as clinicians, researchers, and patient advocates—to make a difference in pulmonary, critical care, and sleep medicine worldwide.